Almost exactly halfway between New York City and Boston, Madison attracts a sophisticated mix of professionals—lawyers, accountants, architects—as well as a growing community of artists. 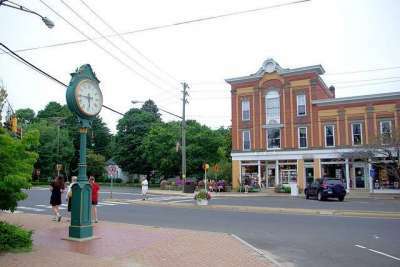 They frequent the town’s independent boutiques and family-owned restaurants, most of which are housed in the two-story shingled and redbrick buildings (many dating from the 1930s) that line Main Street. In the summer, a scenic green in the heart of downtown hosts outdoor concerts and a farmers’ market. Madison is home to Hammonasset State Park—Connecticut’s largest shoreline park—has two miles of beach for shelling. And don’t forget the binoculars: Some 300 species of birds, from loons and ospreys to the lesser-known marbled godwit, call this slice of coast home. Down Boston Post Road, dozens of locally owned shops line the street for unique finds: stationery in Two Ems, artisan jewels at Bella Perlina, and avian items at the Audubon Shop, a destination for birders from all over the Northeast.